If you’re not particularly into gaming and gambling, or it’s your first time to a casino city like Atlantic City, it may dawn on you that when exiting elevators, instead of saying, “Have a nice day” guests at most hotels say “Good luck!” This writer had not been back to Atlantic City in 12 years. The first visit was to the Borgata Hotel Casino & Spa, which at the time was only four years old and then the following year to the opening of its Water Club Hotel in June 2008. This year the Borgata will celebrate its Sweet 16. The Borgata is located in the Marina District of Atlantic City. It has the mandatory slot machines, table games, Borgata Poker Room, Borgata Race & Sports Book (sports betting and off-track wagering). But there’s a lot more to do on the property. There are rooms and suites available at the Borgata and the Water Club Towers. If you want to stay in a less clamorous environment, your best bet is the Water Club. VIP check-in helps you avoid the crowds. The Water Club is smoke-free and quieter than being in the heart of the Borgata, but just take a short walk through the retail space (and perhaps a few dollars lighter) to find where the action is. The Water Club has 800 guest rooms and suites, the two-story Immersion Spa, six designer retail boutiques, meeting space and five heated indoor and outdoor pools. 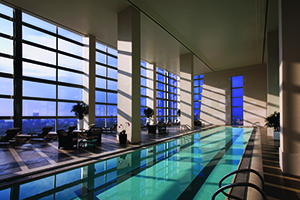 The Immersion Spa was totally booked when I recently visited, so I was off to Spa Toccare in the Borgata Tower, for the 50-minute Rock Your Senses treatment, a combination of Swedish massage, hot stone therapy, with the use of delightfully warm towels. 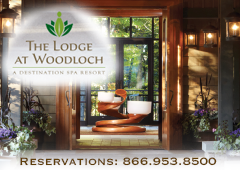 Spa Toccare has two whirlpools, a steam room and sauna to enjoy before and after services. 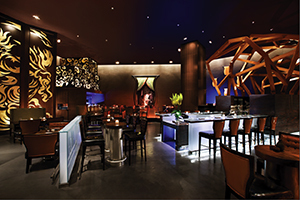 There are several Iron Chef restaurants, including Wolfgang Puck American Grille, Angeline (Italian cuisine by Michael Symon), and Old Homestead Steak House, a classic steakhouse from chefs Marc and Greg Sherry. Also on hand is Bobby Flay Steak designed by David Rockwell to resemble being inside a cow. This may sound a bit unnerving, but the wood ceiling panels that resemble ribs and other features are rather clever. Chef Bobby Flay’s popular signature dish is Philadelphia-style Strip Steak—with good reason. The Provolone Cheese Sauce is mouth-watering delicious. The American cuisine menu also includes such tasty bites as Clams on the Half Shell, Tuna Tartare with classic garnishes, Baked Clams Barcelona, Lobster and Crispy Squid Salad, and of course, Lobster. The menu of Chef Michael Schulson’s Izakaya Sushi Restaurant is gleaned from his time in Japan and draws inspiration from traditional casual pubs of Japan known as izakayas. The menu includes sushi rolls, sashimi, robatayaki (Japanese-style BBQ), and edamame dumplings, from small plates to a full-tasting menu. The tasting menu of appetizers would have been enough! If you don’t have time for a sit-down dinner, there are plenty of casual dining options. Here is a sampling of what you’ll find. In-room dining at the Water Club features a menu created by Iron Chef Geoffrey Zakarian, the hotel’s Culinary Lifestyle Consultant. The Sunroom The Water Club’s lobby lounge also has a menu created by Chef Zakarian. The Metropolitan A full cafe menu of contemporary and classic American dishes and Oyster Bar. Borgata Buffet (breakfast, lunch and dinner buffet offering pasta, seafood, carving stations, desserts by Chefs Thomas Biglan and Thaddeus Dubois. The Grab & Go Market for packaged salads, sandwiches and snacks, Chop & Toss (salads and wraps). Casa Taco Express which offers a American breakfast menu in the morning. There’s a whole lot more including Pizata Pizza & Pasta, Philly Steaks & Subs, and Ben & Jerry’s. For shopping, there are retail stores at The Shoppes at the Water Club and the Retail Piazza at Borgata, and there are complimentary wine tastings on Saturdays at the Vintage Wine Boutique. If you want to venture off property, Atlantic City is known for its factory outlets. For entertainment, there is Borgata Comedy Club; Gypsy Bar, a rock n’ roll tequila bar with live music nightly; B Bar, a bar/lounge on the casino floor; Long Bar, with multiple flat screen TVs and the Event Center has concerts and other performances. Premier Nightclub, an 18,000 square foot club with tiered booths is a beautiful space with a horseshoe shaped mezzanine and a fascinating, huge movable, color-changing light fixture above the dance floor. Borgata makes a fun weekend getaway with plenty to do morning, noon and night. But it’s only the beginning. Borgata is growing with the construction of a new bar and sports wagering venue coming soon. 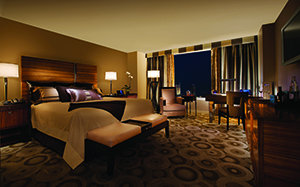 For more information on Borgata Hotel Casino & Spa visit theborgata.com.